Raleigh Dragon Boat Club is pioneering the sport of dragon boating in the Triangle area. Come join one of the oldest and most prestigious sport of the world! 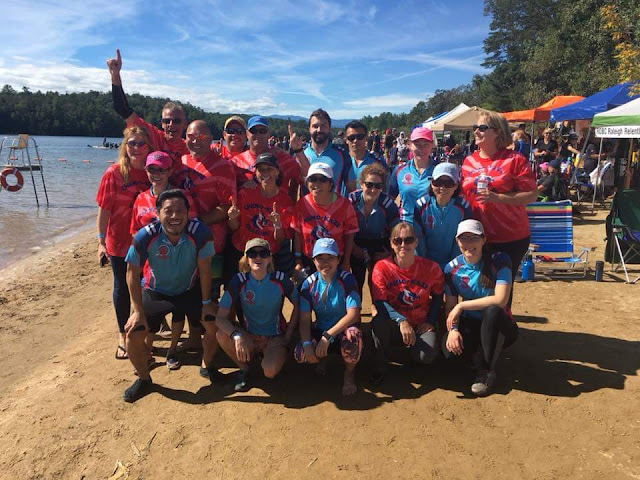 Raleigh Dragon Boat Club is a non-profit organization with 501(c)3 status that is actively cultivating an arena for dragon boat paddling and seeks to share the benefits of the sport with the city of Raleigh and its surrounding communities. We sponsor two teams: Raleigh Relentless and our cancer survivor team Chemo-Kaze! Dragon boating is the fastest growing aquatic sport in the world and it began in China more than 2000 years ago. It originated from a superstitious belief that boat racing would ensure prosperous and bountiful crops. A dragon boat team consists of 20 paddlers, who sit two abreast. From the rear, there is a cox who steers the boat and in the front, a drummer who drums to keep the team in unison. Teams can be all men, all women, or mixed crews. The team of paddlers work together to move the boat from a standing start with the goal of reaching the finish line with the fastest time. In general, a race may consist between 4 and 6 boats. There are 4 elements for a successful dragon boat team: Timing, strength, endurance, and teamwork. The fourth is the most important and likely the driving force that the sport has achieved such a high profile around the world. Everyone is encouraged to try this exciting sport that epitomizes a team spirit.